Now just what was the promise and vision of the founders of the United Nations that the President claims we are close to implementing? One logical place to start in answering this question would be the charter of the United Nations. Charters are where founders often tell the world their hopes and vision for the new society they seek to establish. This means the military forces of the United States, which exist for our common defense and will expend the lives of our own sons, are in fact under the beck and call of unelected aliens who can use them as they see fit. In light of this, it would seem that we should stop referring to the President as the Commander-in-Chief. According to Article 46, the command function of our armed forces is now handled by the UN Security Council with the help of a committee. If the UN can direct the deployment our armed forces, even requiring rights of passage through our territorial jurisdiction, can we even call ourselves an “independent country” anymore? If the UN can order UN members China and Finland to station troops in Omaha, Nebraska in order to maintain peace and security, how are we any different than occupied Japan in 1946? To add insult to injury, not only do American soldiers have to jump at the UN’s direction, they have to jump and jump right away. Article 45 requires members to hold national air force contingents immediately available for international enforcement actions. Maybe you are having a hard time swallowing the implications of this treaty of which the US has been a signatory since WW2. Does the United States really believe this? Have our Presidents actually allowed the UN to command our troops? This will require new strength and new roles for the United Nations. For disarmament without checks is but a shadow--and a community without law is but a shell. … the recent Belgrade Conference … endorsed a program of "general, complete and strictly an internationally controlled disarmament." It is in this same spirit that we in the United States have labored this year, with a new urgency, and with a new, now statutory agency fully endorsed by the Congress, to find an approach to disarmament which would be so far-reaching, yet realistic, so mutually balanced and beneficial, that it could be accepted by every nation…. The plan to which President Kennedy repeatedly refers was released as Department of State Publication 7277, titled, Freedom From War:The United States Program for General and Complete Disarmament in a PeacefulWorld. 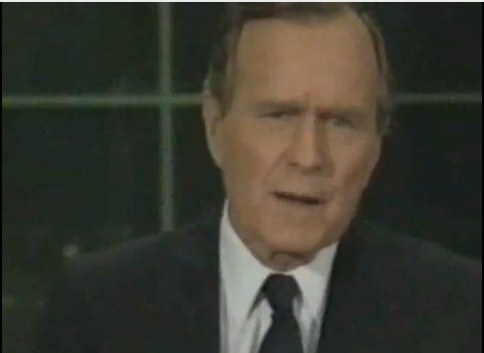 If you are unfamiliar with this program, maybe you just forgot to follow President Bush’s infamous admonition to the American people, “Read my lips.” Click here (or the video below) to do so. By continuing to do many of the same things as President GW Bush, Obama angered many of his strongest supporters. They could not understand why he broke his campaign promises to them. The reason he broke his campaign promises and has continued doing the same things President Bush was doing is because he is following the same agenda as President Bush was following. As President, Romney has indicated he will also follow the same agenda. He supports the Patriot Act, NDAA, foreign wars, the Federal Reserve, unions of homosexual fornicators, and the murder of some babies. Every president since Calvin Coolidge has followed this same agenda, some more and some less willingly than others. Every President since Truman (yes even Reagan - remember Beruit?) has committed troops under the auspices of the UN. US troops have served under foreign command wearing foreign uniforms (Remember Michael New ?) since President Bush. In all likelihood, the next step in implementing this agenda is stationing foreign troops on US soil. OSCE, a regional "UN group" has already been monitoring US elections since 2002. While it is encouraging to learn that they encountered some resistance trying to station foreign observers in Texas polls next week, this is just lip service to placate the naive just like their "support" of the Rep. David Simpson's TSA Anti-groping bill. If Romney were planning to follow a different agenda in his presidency, he would be supporting Attorney General Greg Abbott. He would be speaking out against the advancement of this agenda, like Ron Paul has consistently done. The fact that he is completely silent on this matter is good evidence that his principles are not based on the constitution or the Truth of God's law. A vote for Romney is a vote to continue the exact same course we have been on the past 4 years. With this question, Mark R. Crovelli opened a persuasively argued and brilliantly illustrated volley against the Biblical doctrine of the total depravity of man in which he rightly painted Thomas Hobbes' view of the civil magistrate as immoral tyranny. The rainbow is the sign of God's covenant never to destroy the earth again with a flood. As long as earth remains, seed time and harvest, summer and winter, hot and cold, day and night will not cease. Implicit in this promise to sustain the earth is the promise to restrain the wickedness of man so that God's justice does not require a temporal judgment so severe as to destroy the earth. Concurrent with this promise in Genesis 8 is the command for men to shed the blood of those who shed human blood. With this authority God established the means through which he would accomplish this restraint of evil. Anyone who thinks this authority unnecessary has no more wisdom or foresight than a pilot who thinks airplane engines are not necessary to sustain flight.